Midsummer Cake. I Capture the Castle. We burnt the salt and the herbs (in America it is correct to drop the h in herbs - it does sound odd) and shared the cake with Héloïse; Simon only had a very small piece, because he was full of dinner. This week was Midsummer, a celebration of the summer solstice: the day when the sun is highest in the sky, and there is the longest period of daylight. Here in the Cotswolds, we watched the sun slowly descend, in glorious shades of orange and red, and then finally slip over the horizon at about 11pm. I've not, in any of the years I was in London, been as aware of English seasons as I am now. Perhaps it's the obvious arrival of summer - the pollen that's been driving me slowly insane over the past fortnight, or the heatwave that makes working outside in the sun impossible. But I think it's more likely that I am living surrounded by neighbours who bring a small bowl of redcurrants straight from the bush in their garden. That I can point out the budding apple blossom, or walk off up to the Common to collect elderflowers. That the tree I duck under on my running route is now covered with glorious yellow flowers - I risk bumping my head on the church gate every time I avoid it. That I can see the new produce in our local farmer's market each week; I've kept a list of the food as it appears, already making plans for next year's bounty. I can see, with astounding clarity, the seasons shift and change. 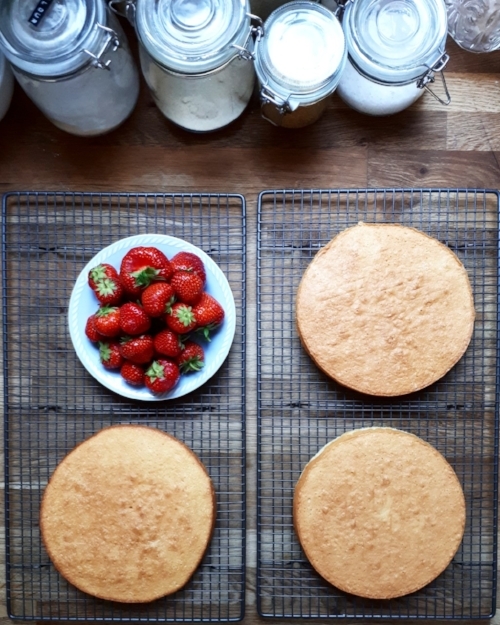 Without wanting to wish away the months of asparagus, and broad beans, and strawberries, passing the midpoint of the year also reminds me that we're heading into autumn, my favourite season. By the time it arrives, I will have finished drafting my next book, and this feels worthy of acknowledgement, (panic, obviously), and a small personal celebration. I turned, as I so often do at this time of year, to my very favourite book, rereading I Capture the Castle during one long, impossibly warm night, as sleep eluded me. Though I have featured it in this column before, I felt compelled to include it one final time. This week turned out to be perfect. Towards the end of the book, with her beloved sister Rose in London, Cassandra celebrates Midsummer alone, carrying out long-standing family rituals: making a garland of flowers, burning salt and herbs, eating a ceremonial cake, lighting a bonfire, and then - slightly more unexpectedly - a snog with her sister's fiancé, Simon, who arrives as she is dancing around the flames. 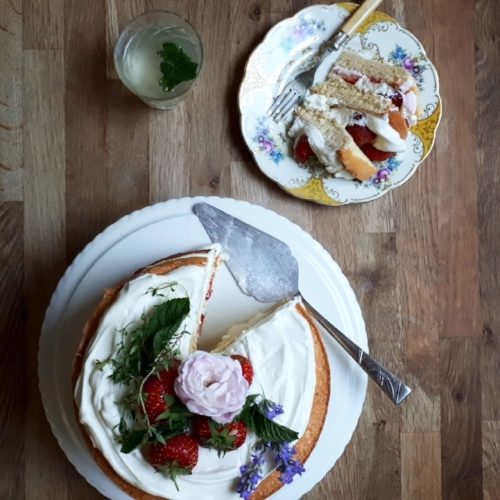 This is a version of the cake, a riff on a Swedish Midsommar recipe that Cassandra, suddenly able to buy groceries again, after years of poverty, could have pulled together. This will be my final Novel Recipes column for the Guardian. It's been a joy to write over the past three years - thank you for reading it, sharing it, and cooking from it. If you'd like to keep in touch, about my next book, upcoming events, or my other writing, keep an eye on my website: The Little Library Cafe. 1. Heat the oven to 160C (fan). Separate the eggs, and put the yolks in one mixing bowl, and the whites in the other. Add the sugar and cordial to the yolks, and whisk until pale and smooth. Beat in the flour. 2. Beat the egg whites to stiff peaks, and fold a third into the yolks to loosen the batter. Fold in the other two thirds. Divide the batter between three well greased and lined sandwich tins (you can do this in batches if you don't have three tins). 3. Transfer to the oven for 20 minutes, until the cakes are risen, golden, and coming away from the sides of the tins. Bring the cakes out of the oven, cool for five minutes in their tins, and then completely on a wire rack. 4. Pour the cream and elderflower into a clean bowl, and beat by hand to soft, billowy peaks. Go slowly towards the end, as it's so easy to overmix, and for the cream to split - especially in summer. 5. Finally, layer up the cake. Hull all the strawberries, saving a handful of the prettiest ones for the top, and slice the larger ones into pieces. Spread a third of the cream onto one of the cakes, top with strawberries, and then place another cake on top. Spread with another third of the cream, then more strawberries. 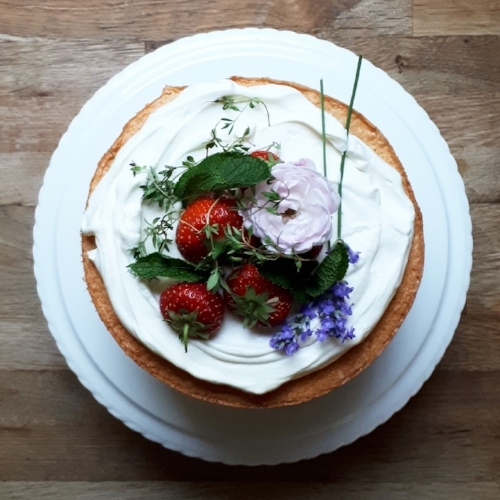 Place the final cake on top, then top with the cream, and decorate with strawberries, thyme, mint, and edible flowers. Store in the fridge until you're ready to eat it, and serve in generous slices. That morning Pippi was busy making pepparkakor – a kind of Swedish cookie. She had made an enormous amount of dough and rolled it out on the kitchen floor. And there she lay on the floor, cutting out cookie hearts for dear life. Eight Christmases ago, I experienced my first Swedish Christmas. We spent all day on Christmas Eve preparing the julbord, a smörgåsbord that we only ever have on December 24. That first year, so much of it was unfamiliar: the pickled herring, the crisp bread, the lingonberry jam that accompanied the meatballs, the bottles of fizzy julmust, the tins of sprats layered through the Janssons frestelse, the tiny glasses of akvavit that made me lightheaded, the song I didn't know the words to. In subsequent years, it has come to rival Christmas dinner as my favourite meal of the season. It feels like part of the fabric of Christmas now, as much as It's a Wonderful Life or plum pudding. I've even had a small influence on the ritual - we now cook the ham the Nigella way (in Coca Cola) at my suggestion, before glazing it with the traditional mustard, sugar, egg, and breadcrumbs. I have my own favourite parts of the meal: the boiled eggs topped with Kalles Kaviar, the pickled herring with juniper, and the Janssons, a dish I now look forward to every year. I can even blag my way through the chorus of the song we sing, before we throw back our shot of akvavit. All the recipes for this meal are taken from a cookbook that my Cotswolds-based surrogate mother has on her shelves. It is familiar, and worn, and filled with pictures of aggressively decorated seasonal tables laden with food. I irritate her every year as we cook from it, asking that she again translates smör (butter) and musket (nutmeg), and explains how to measure out flour and sugar in decilitres. For so long, we have followed tradition, and stuck to the familiar pages in the book. But in the past couple of years, we have started to add new things - a beetroot, potato, apple, onion and gherkin salad this year, and a batch of homemade pepparkakor on Boxing Day. The biscuits themselves aren't new; there is always a tin of pepparkakor waiting, alongside the Christmas cake, to be eaten in the final days of December. The ones from IKEA have always served us well, but I have discovered, to my delight, that no biscuit is simpler to make. The dough is incredibly forgiving, happy to be rolled and re-rolled as you require. The making of the dough takes minutes only. I appreciate that, at this point, the last thing you need to fill your house with is a box of 60 biscuits. But they're just too good to keep to myself. Put some of the leftover Stilton on them, and settle in for the last of the Christmas telly. 1. Bring the water, golden syrup, sugars and spices to the boil over a low heat. Pour them over the butter in the mixing bowl, and leave for a few minutes to cool. The butter should have completely melted by this stage. 2. Sieve the bicarbonate of soda and flour into the mixture. Stir to combine and bring together in a dough. Leave the bowl in the fridge for a couple of hours, preferably overnight. 3. Preheat the oven to 200C. Flour your work surface, and roll the dough out as thinly as you can - a couple of millimetres thick is about right. Line your baking trays. Cut shapes out of the dough, and arrange them on the tray, leaving a little space for them to spread slightly. 4. Transfer each batch to the oven and bake for five minutes, until slightly crisp around the edges. Leave to cool on the tray for five minutes, and then completely on the wire rack. The biscuits should be crisp. Serve plain or with cheese - they're lovely with Swedish cheese, or good cheddar. Kristina had baked a potato pancake which she divided among husband, children, and brother-in-law; as yet she would not open the butter tub. Like many Australians, one must draw lines over oceans and continents to trace my ancestry. If you look a couple of generations back, our 'Australian' family is made up of a collection of different European strands. Somewhere along each strand, sometime in the past two hundred years, there's a person (or people) who made the decision to start a new life on the other side of the world. I made a journey in the opposite direction, from Brisbane to London, in 2009. When compared with the experiences of my ancestors - escape from famine, six month long sea voyages, forced transportation and imprisonment for petty crimes - my 24-hour journey seems positively luxurious. I have vivid memories of looking up at my mum, stepdad and sister, standing stoically at the top of the escalators in Brisbane International, as I shuffled through the Customs queue below. I finally lost sight of them as I pushed my passport across. A day later, I sat in Kensington Gardens, under the statue of Peter Pan I remember from my childhood (or maybe Hook - I've never quite worked out which), on the phone with my mum. I was desperate for reassurance that I hadn't made a foolish decision. We've texted, emailed, Skyped and spoken on the phone countless times since. Technology truly is amazing, shrinking this enormous world down to a somewhat more manageable size. Even my mum and dad's time here in the 80s - letters home and the occasional expensive telephone call - seem like a different world. What I find most extraordinary and captivating in The Emigrants is the same thing always astounds me when considering the lives of my ancestors. To secure passage on a ship to the 'New World', for a mere whispered promise of a better life, takes courage I can not fathom. Far from my experience - a couple of friends in England, my parents' experience here and endless online research to guide me - my (many times) great grandmother stepped onto a boat in Ireland as a teenager. She was leaving behind the potato famine that had killed most of her family, for an unknowable life in Australia. I now have family in many corners of the country. We're living evidence of her bravery, strength in imagining a different life for herself and, of course (less romantically), the complete lack of options she was faced with. At my most homesick moments, wondering why on Earth I have settled so far from the family I adore, I find myself thinking of her, and other members of my family, all around the world. And I realise that this is what we do. Kristina's potato pancake, baked, sliced and shared with family, was a revelation to me. The basic batter is the same as one you'd pour straight into a frying pan when making the type of pancakes I am more familiar with. The addition of grated potato bulks the dish out, providing an ideal vessel for bacon, lingonberry jam and good, salted butter. The pancake itself is, as my friend Anna labelled it, reassuringly bland; comforting in a way that only a potato is capable of. A taste of home, served just as Karl Oskar and his family prepare to leave it. 1. Preheat the oven to 225C. Tip the flour into the bowl, add the salt, and make a well in the centre. Crack in the eggs, add a little milk and start to whisk from the centre, bringing the flour in slowly. Continue to add the milk as you whisk in more of the flour. 2. Once you have added all of the milk, grate in the potato. Fold this into the batter so that it is evenly distributed. 3. Grease the oven dish, and pour the batter in. Bake in the oven for 30-35 minutes, until the pancake is puffed in the middle and golden brown. It will deflate a bit once you bring it out of the oven. Cool slightly, then slice and serve. Leftovers are really good cold too, so do make sure you over-cater. Gravlax on Rye. The Girl with the Dragon Tattoo. Then he made himself lunch, which consisted of coffee and open sandwiches, and sat in the garden, where he was typing up the notes of his conversation with Pastor Falk. When that was done, he raised his eyes to the church. There's nothing more satisfying than preserving food. In times of plenty - a glut of cucumbers, boxes of overripe tomatoes, a whole side of salmon - there is joy to be found in keeping some back for later months. Salt, sugar and vinegar are my constant allies; they've been by my side during bouts of chutney making at Christmas-time, helped me keep the taste of a trip to Normandy alive with a very special plum jam and ensure that I can extend the radish season each year (at least in my house). More than anything else, preserving food feels like a genuine link to previous generations - I'm doing what my great-great-great-grandmother's generation would have done, before refrigeration or Sainsburys Local or Deliveroo. One of my very favourite examples of old-school food preservation is gravlax; a Scandinavian method of preserving fatty fish with salt and sugar. Originally buried underground, it is now more commonly buried under a mountain of dill. I could eat it on/with pretty much anything, and am still rationing the leftovers from this batch. When at Billingsgate a couple of months back, I couldn't walk past a side of salmon, thrown unceremoniously into a garbage bag by a giant man with an enormous beard. It's served me well; sliced up into fillets that have stocked my freezer for months, and allowing me to fulfil a long held desire: curing my own salmon. Not bad for £12. There are lots of other (less murder-y) books I could have used here, but I immediately thought of this. I lost count of the number of open sandwiches Mikael Blomkvist sat down to eat - my memories of the book are definitely more focussed on the sandwiches and coffee (I've worked hard to leave other particularly vivid memories behind). 1. If you've bought a whole side of salmon, you're going to need to select which part to turn into gravlax. You'll need two equal(ish) sized pieces that have a similar thickness, otherwise you'll end up with bits that are over- or under-cured. Leave the skin on, but do de-scale if this hasn't been done already. 2. A fishmonger should be able to tell you whether you're buying sushi-grade salmon - the type you can confidently eat raw. If you're not sure, then freeze it for 24 hours before adding the cure. This will kill any parasites. I managed to freak myself out, forget what the guy at Billingsgate had said, and froze mine just in case. It still tasted glorious. 3. Defrost your salmon (if you've frozen it) and place both pieces skin side down on the bench. In the mortar and pestle, pummel your pepper, then add the salt and sugar and mix thoroughly. Chop the dill. 4. Place half of the dill on top of one of the pieces of fish, then pack the salt, sugar and pepper mix on top. Cover with the other half of the dill, then place the other piece of fish (skin side up) on top. Place the whole dill/fish sandwich into the flat dish and cover with cling film. Place another dish on top, push down, and weigh down with tins. Place in the fridge. 5. The gravlax will need to sit with its cure for 48 hours. Turn it every 12 hours, draining away the liquid, then replacing the cling film and weight each time. In terms of timing, turning it before and after work worked for me. You don't have to follow the 12 hour rule religiously - I was home a bit late one night, but it survived (full disclosure: I was a little full of gin, and nearly forgot about it completely, but I reckon it would have been OK if I had). 6. When your gravlax is ready to eat, prepare the cucumber pickle. Slice the cucumbers very finely (a mandolin is handy here, but not compulsory). Dissolve the sugar and salt in the vinegar. Layer the cucumber slices, dill fronds and coriander seeds in the jars, then pour the vinegar mixture to the top. Turn the jar over a couple of times to ensure the vinegar has reached the bottom. Leave for at least 30 minutes to pickle slightly, though the leftovers will be great too, for at least a couple of weeks. 7. To serve, scrape the cure off the salmon. Slice perpendicular to the bench, lifting each slice away from the skin. Slice it to your taste - I like it much thicker than it usually comes when packaged. Butter slices of the bread, top with salmon, the cucumber and a dribble of the pickling juice. Serve with coffee.